What Are Your Application Performance Metrics Trying to Tell You? Businesses depend on applications to drive critical activities and to better engage customers, employees, and partners. So in today’s app-centric world, business success is contingent on superior-performing applications. 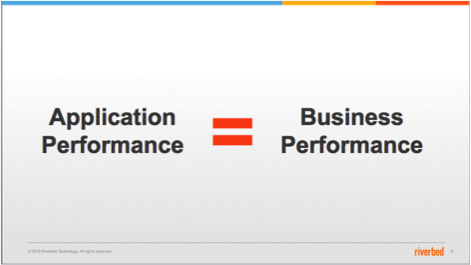 But how do you actually measure the business value or impact of application performance? Our latest white paper explores how to do just that. Here’s a preview of what’s included in the paper, including why this type of value measurement system is important for today’s IT leaders, along with some top considerations for getting started. Why measure the business impact of application performance, and why now? Many CIOs and other technical leaders are reexamining how they articulate the business value of IT to their business peers. Because applications underpin most critical business operations and processes, a good starting place is showcasing the business impact of these applications and other services IT is already delivering. Moreover, being able to quantify this relationship between app performance and business performance couldn’t come at a better time. Almost weekly, it seems like a news story breaks telling us how an application or system outage temporarily shuts down a major business or organization. The stats above all tell a rather negative story. Wouldn’t it be nice to also show how applications positively impact the business when they’re performing at or above expectations? Of course it would! And it all starts with developing the proper application performance data collection, analysis, and value reporting strategy. That said, developing this strategy might be easier said than done. Why? An unprecedented amount of data is being generated in the digital age, so pinpointing the data points that matter most to the business is often a challenging exercise. IT needs to shift how it monitors application health because traditional metrics, such as availability and response times, don’t clearly reflect how revenue, employee productivity, customer retention, and other business key performance indicators (KPIs) are impacted. 64% of organizations still rely on a fragmented approach to monitoring applications2. So while many of these businesses are actively looking to application performance metrics for business intelligence, the process of aggregating and presenting data from so many sources—in a business context—is quite cumbersome. Speak the language of the business: Practical tips for identifying the KPIs that matter most to your business stakeholders, and mapping those to traditional application performance metrics. Eliminate siloed approaches to performance management: Converging performance metrics into a unified platform so data can be collected, analyzed, and presented as actionable findings—faster, more accurately, and with less manual effort. Establishing transparency: Creating dashboards that present all this information to various stakeholders in an easily-consumable, meaningful way.